Two of Japan’s stellar doubles partnerships suffered shock losses in today’s second round of the Fuzhou China Open 2018 to senior pairs seeking to find their way back to the top. First came the defeat of Women’s Doubles top seeds, Yuki Fukushima/Sayaka Hirota, at the hands of Chang Ye Na/Jung Kyung Eun (featured image); falling tamely 21-13 21-11 in 37 minutes. The experienced Koreans – paired late last season after partnering younger players – never gave their rivals a chance, leading both games from start to finish at Haixia Olympic Sports Center. Japan – the nation that has dominated Women’s Doubles this year – also lost No.6 seeds Shiho Tanaka/Koharu Yonemoto as well as Naoko Fukuman/Kurumi Yonao – as fate would have it to Korean opposition also. Seventh-seeded Lee So Hee/Shin Seung Chan put paid to Fukuman/Yonao’s aspirations (21-16 21-12) while Baek Ha Na/Kim Hye Rin took care of business against Tanaka/Yonemoto (21-15 21-13). A fourth Korean duo, Chae Yujung/Kim So Yeong, ousted China’s No.3 seeds Chen Qingchen/Jia Yifan (21-9 21-18). Despite the demise of three women’s tandems, Japan’s hopes will still be high as Olympic champions, Misaki Matsutomo/Ayaka Takahashi, and World champions, Mayu Matsumoto/Wakana Nagahara, advanced to tomorrow’s quarter-finals. The latter will have the opportunity to avenge their team-mates’ loss when they face Chang/Jung for a semi-final place. A second equally-stunning result awaited the Japanese in Men’s Doubles late in the night as Mohammad Ahsan/Hendra Setiawan produced an incredible comeback to topple No.4 seeds, Takeshi Kamura/Keigo Sonoda. 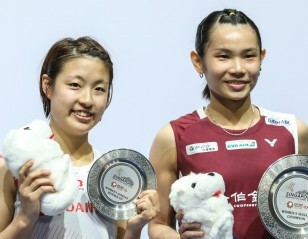 The veteran Indonesians – currently tenth in the HSBC Race To Guangzhou – prevailed 13-21 21-17 21-9 as the usually energetic Kamura and Sonoda wilted in the third game. “In the second game we tried to be patient because the shuttle was very slow. When we got the chance to attack, we did so with full power. We kept the same tactics in the third game and Japan was not as strong as they were in the first game. “We are surprised, especially to win 21-9 in the third game. We didn’t expect that,” said 34-year-old Setiawan. The 2013 and 2015 World champions face young Indians, Satwiksairaj Rankireddy/Chirag Shetty, for a place in the final four which would boost their chances of finishing in the top eight and qualifying for next month’s HSBC BWF World Tour Finals. “The Indians are quite good but we will try our best. I think it’s 50-50. We are aiming to do well here and in Hong Kong and see if we can go to the finals in Guangzhou,” added Setiawan who renewed his partnership with Ahsan this season. Meanwhile, three Chinese pairs also advanced to the quarter-finals and there’s certain to be at least one semi-finalist for the hosts with No.2 seeds, Li Junhui/Liu Yuchen, clashing with their compatriots, He Jiting/Tan Qiang. China’s other pair, Liu Cheng/Zhang Nan, scrambled past Malaysia’s Goh V Shem/Tan Wee Kiong, 21-19 20-22 21-15, to book an appointment with Liao Min Chun/Su Ching Heng of Chinese Taipei. Indonesia’s star pair, Marcus Fernaldi Gideon/Kevin Sanjaya Sukamuljo, will be up against Denmark’s Kim Astrup and Anders Skaarup Rasmussen. 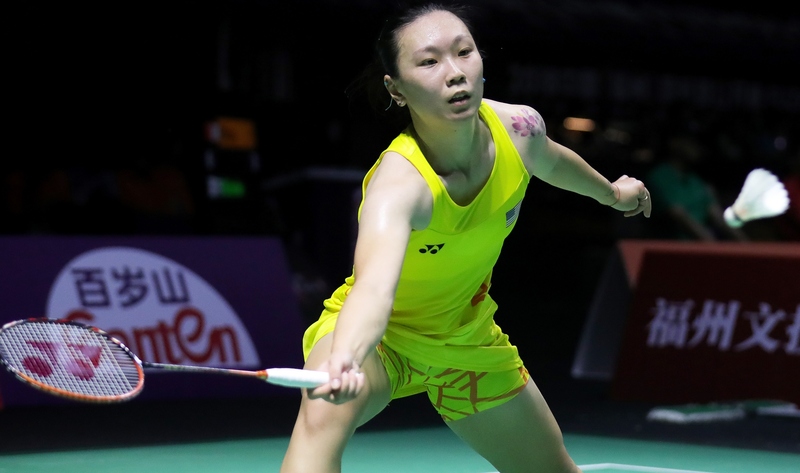 In Mixed Doubles, three Chinese pairs strode into the quarter-finals, with top seeds Zheng Siwei/Huang Yaqiong, Wang Yilyu/Huang Dongpoing and He Jiting/Du Yue, all winning their fixtures. 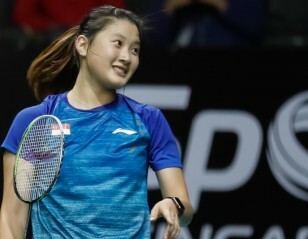 Also in contention are Japan’s Yuta Watanabe/Arisa Higashino, Korea’s Kim Won Ho/Baek Ha Na and Thailand’s Dechapol Puavaranukroh and Sapsiree Taerattanachai as well as two Indonesian pairs – Tontowi Ahmad/Liliyana Natsir and Praveen Jordan/Melati Daeva Oktavianti. Japan’s woes extended to singles with Kenta Nishimoto and Kazumasa Sakai bowing out of the men’s event and No.2 women’s seed, Akane Yamaguchi, falling 21-18 21-18 to Beiwen Zhang. The American will oppose Olympic and World champion, Carolina Marin, tomorrow; the latter downing Chen Xiaoxin (21-17 21-11) today. Elsewhere, India’s Pusarla V Sindhu will have her hands full with local hopeful, He Bingjiao, while Ratchanok Intanon of Thailand takes on another Chinese, Chen Yufei. The last quarter-final is an all-Japan affair featuring Nozomi Okuhara and Sayaka Takahashi. The younger Takahashi sister beat China’s Gao Fangjie (21-15 19-21 21-18) en route to the last eight. 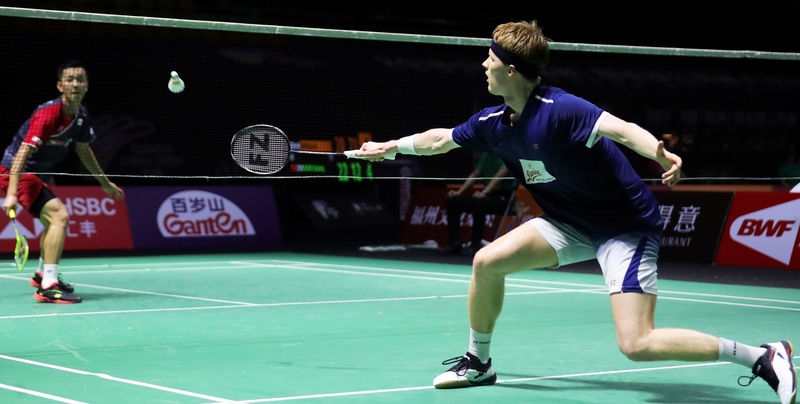 Despite losing two Men’s Singles competitors, Japan will be confident that Kento Momota can again deliver as the top seed tackles Korea’s Son Wan Ho. Having dispensed with his countryman Jonatan Christie, No.8 seed Anthony Ginting now sets his sights on No.2 seed Shi Yuqi; one of two Chinese in the hunt. The other is rejuvenated Olympic titan, Chen Long, who will oppose Nishimoto’s conqueror, Anders Antonsen. The young Dane won his second-round match, 21-14 20-22 21-16. The fourth quarter-final is between No.4 seed, Chou Tien Chen of Chinese Taipei, and Kidambi Srikanth. Chou progressed 21-15 21-19 versus Liew Daren (Malaysia) while India’s Kidambi bounced back to thwart Tommy Sugiarto of Indonesia, 10-21 21-9 21-9, in 44 minutes.